A child’s brain can be compared to a sponge that absorbs everything that surrounds it. It is just waiting to be packed with as much knowledge as it can absorb, and it is up to parents to fill it up with all the information it is asking for. One way to do this is providing educational toys for toddlers. There are a lot of toys out there that can provide children of this age with knowledge on shapes, colors, and other things to help in their proper development. When choosing educational toys for toddlers, pick those that can teach them to build up their skills in reading and writing, as well as enhance their motor skills and promote emotional growth. A very important factor that is needed for reading is being able to distinguish between the different shapes and forms, specifically letters for reading. Educational toys for toddlers that focus on this are puzzles. You can begin with 2 to 3 piece puzzles, and add on fit-in and form and shape puzzles as well. To develop writing skill, simple construction toys can improve hand and finger dexterity. Some educational toys that can do that include crayons, wooden and construction building blocks, strings of big beads, pegs and pegboards, and interlocking blocks. Educational toys for toddlers that facilitate emotional growth come in a wide selection. Fantasy toys are great for this purpose, such as dolls, teddy bears and other stuffed toys, farm toy animals, and human figures are just a few you can choose from. Toddlers must also be given toys to improve on two of the most basic skills, namely the gross motor skills, which allows them to move around well, and the eye and hand coordination. Some of the recommended educational toys you can use are wagons, scooters, push and pull toys, balls in bright colors, wheelbarrows, tricycles, and bikes, among others. By giving your toddler educational toys to play with, you are also providing him with the best opportunities to grow up healthy, both emotionally and physically. The “LeapFrog Fridge Phonics Magnetic Letter Set” is a fantastic way to help teach your little one letters, sounds, and words. 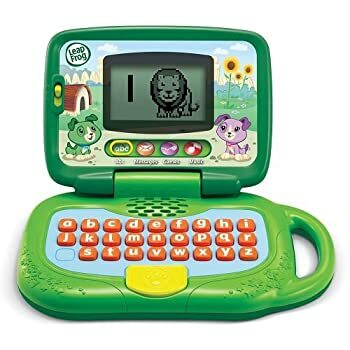 It is fun to activate, colorful and visually appealing, the singing voice helps reinforce the letter’s sound, and the compact bus – measuring about 5” X 5” X 1 ½” – does not dominate your refrigerator display space. The bus and letters are sturdy enough to survive accidental dropping multiple times. 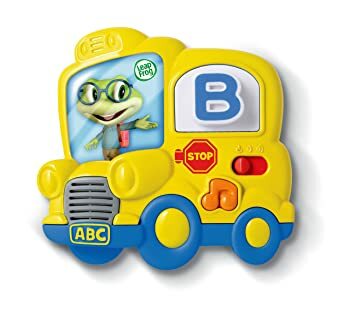 When placed in the bus window, the letter sound is spoken clearly giving the letter name and sound, then you press again to hear a sentence using a word beginning with that sound. The voice is pleasant and the accent is English thank goodness! Pressing the music notes on the bus gives you the alphabet song and a quick rendition of The Wheels on the Bus. Children ages 2 and older can explore letter names, letter sounds and early vocabulary as they place interactive letters into the bright yellow bus. Children can also sing and dance along to three learning songs while building important skills for reading. The Fridge Phonics Magnetic Letter Set is a brilliant and fun educational toy that would really help your young child with letter and word sounds and also letter recognition. Fisher Price products is one of the best brands for baby toys and products and that is that they are always cleverly thought out, of a beautiful design, durable, entertaining, educational, encourage baby to develop and are always high quality just to name a few. This activity center from Fisher Price features lights, sounds and music to stimulate your toddler’s senses and help your bundle of joy develop fine motor skills, balance and coordination. The convertible play gym is designed to “grow” with your child, meaning babies can start by lying on the machine-washable padded mat, before graduating to sitting down and playing, and finally standing at the activity center. 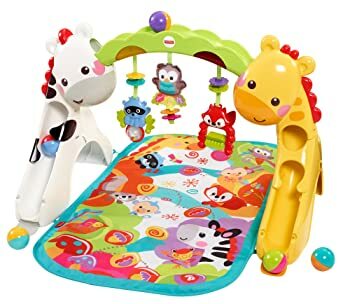 The gym has three grow with baby modes; Stage 1 which is where it is the traditional type of baby gym and baby lies underneath the toy bar on the mat. Stage 2 which is where some other gyms we have had in the past also cross over into and this is were baby can sit and play. Stage 3 which is where baby can stand and play. 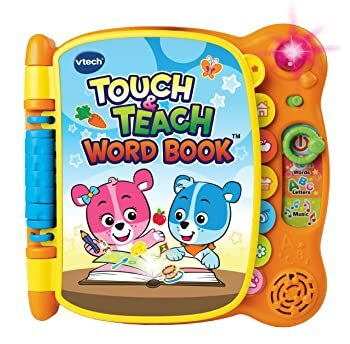 My First Word Book from Vtech features 12 incredibly detailed and touch sensitive pages that help teach your baby over 100 words in six categories: Your home, Food, Clothes, Toys, The Park and the Zoo. It has four models of play including: What’s That Word, Letter Fun, Music Time and Find It. The toy book is great in helping the toddlers develop fine motor skills and enlarge vocabulary while they are having fun. This educational toy also includes a Find It mode that asks questions about what has already been learnt so encouraging repetition and independent play. 12 interactive pages come to life at the touch of a finger! Durable plastic pages are wipe clean and non-rip so baby can play again and again. This talking picnic set is designed to help kids learn about shapes, colors and manners with fun learning songs and sound effects. Toddlers can also build their motor skills with sorting, matching and stacking activties. 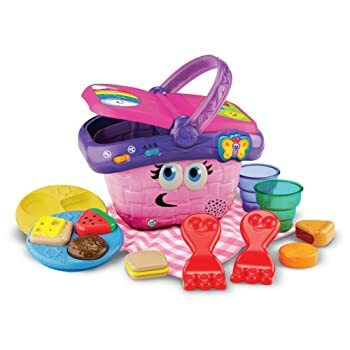 The set includes six food items, two plates, two forks, two cups, one blanket and one basket that all help to stimulate your little learner’s imagination. Everything is made of hard plastic, except for the checked “blanket” which is like a handkerchief. The basket is packed pretty full with everything inside. It has two modes of play; music and learning and the picnic basket responds to whichever setting you select by using the slide on the front of the picnic basket. For example in the music mode it plays several tunes such as teddy bears picnic when you lift the basket lid and in the learning mode it says phrases such as “picnic time” and “yummy apple pie, can you put the apple pie in the triangle place” along with “open” and “close” and “the biscuit is a circle can you find another circle” plus many many more phrases that are too many to list so it really is extremely interactive and educational.